My apologies on the picture. I had to grab one from a royalty site because I keep forgetting to grab a pic of mine. Its an exact match, though, so no worries on misrepresentation. Now, that being said, this weekend I started playing around with Dinner Rolls and somehow, I managed to make something that my kids AND husband went NUTS over. My one son, who only eats roast beef, was throwing ham and cheese on them. Between him and my husband, I had to run to the store the next day to buy more deli meats, not to mention my daughter gobbling them up. Now, below, under the recipe, there are two amounts of sugar. While I explain both there, I am going to explain here as well. The lesser amount of sugar, makes a delicious roll – and that is the one my family tore up the first time. The second amount of sugar (which I put restaurant roll amount) will create the sweeter rolls people love at certain restaurants like Golden Coral, Wood Grill, and other Steakhouses. Both are absolutely delicious. 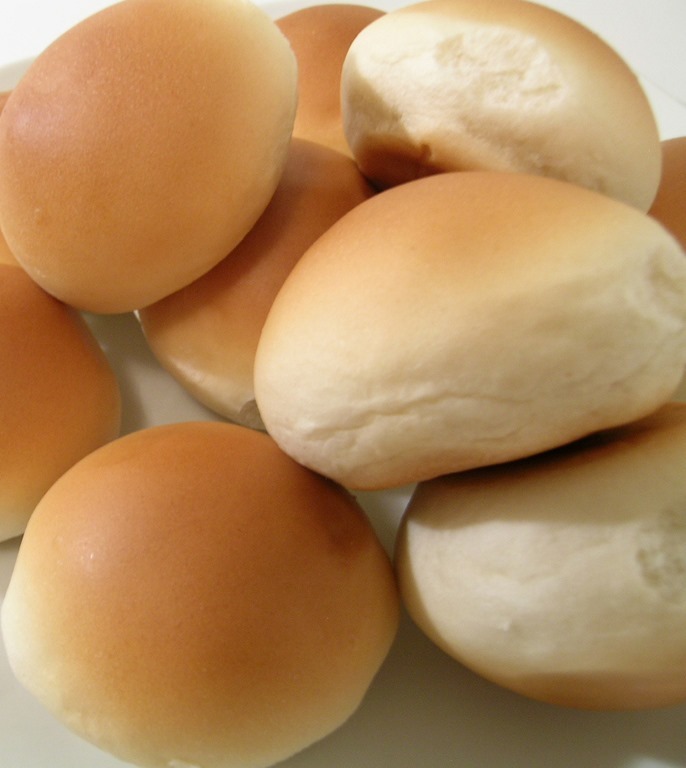 You can use these for Hamburger buns, Ham or deli sandwiches, with butter or however you like a roll. Try both because BOTH are delicious. I also know that there are a lot of recipes floating around the internet claiming they are a sweet roll and like many recipes, are not. I can vouch for this one. I have made a ton this weekend and I will be making a ton today. If you make them, let me know which you like best unless you are like us and love both. If you have any problems, also, let me know. Maybe I can help. The original recipe, I found in the book, America’s Bread Book by Mary Guber. Scanning the internet, I messed around with sugar amounts and became satisfied with the one below (restaurant roll). Remember, any notes I make, etc. I will highlight. In a mixing bowl, combine the yeast and water, whisking until the yeast dissolves. Next, add the Buttermilk, baking soda, baking powder, salt, sugar and oil. Add 3 cups of flour, beat or mix until its nice and smooth. Next, add the rest of the flour little by little until you have a soft dough. You may or may not need the full 5 cups. Knead the dough for at least 10 minutes on a lightly floured surface. Brush a bowl with butter and place the dough inside. Cover with plastic wrap – loosely – and then a towel. Let the dough rise until doubled – 1 hour. Next, Punch the dough, knead lightly, cover it up and let it rest for 10 minutes. Roll dough out to 1/2 inch thick—cut out your rolls (if you don’t have a cutter, use a wide mouthed Mason Jar) – place rolls on the baking sheet about 1/2 inch apart. Cover and let rise about 1 hour until the rolls are puffy. Brush with melted butter. Bake in a preheated oven 400 degrees about 15 minutes or until golden brown. Brush again with melted butter. If there is a chill in your house, if your rolls are not rising as they should – You can place the bowl (during the first rise) inside a bigger bowl filled with hot water. The second step, sit them on top of the stove while the oven is on. Other reasons could be, the Yeast and the Buttermilk. Did you put the yeast in water that was warm enough? Was the Buttermilk warm enough? Was the roll light and moist or heavy and dense? Maybe you added too much flour especially during the kneading process.